White Chocolate.... for your face! Well, well, well, it's been a while since one of these sachets graced a post for a review but here we are again! I know you all know how much I love these bargains face masks from Montagne Jeunesse (now known as 7th Heaven by the way! ), at only £1 each they really are a beauty gem and one of my favourites finds of the last 10 years! This week I decided to try out the ever-so-yummy-looking White Chocolate mask. This had been sat in my bathroom drawer for months and I have no idea why I decided to wait so long to use it, so foolish. I think this may have come in a gift pack I got from co-op a long while ago.... or I may have picked it up in Primark - I can't be certain. With cocoa butter and cream - this mask smells amazing. I love the scent of anything cocoa butter so I happily slapped a thick layer of this stuff all around my face - which still left half the sachet left so this is definitely one to share with a friend/partner/mum! I left the mask on for about 15/20 minutes, it got to that lovely stage of being so hard it cracks a bit - I love this feeling so much, anyone else? I washed it off gently with warm water and a muslin cloth and was pleased to be met by fresher looking Kirstie than 20mins prior, with skin looking a little bit more awake and feeling super soft. Another fantastic mask by the team at 7th Heaven, I'm going to have to see if I can pick this one up again for when I'm looking a bit dull and tired... .or I may just have to do an online order..... although my wishlist is so ridiculously long I don't know if it's a good idea haha! These masks are great if you want something a little different without breaking the bank. I used to love the peel off ones when I was younger but the self-heating ones are my favourite as they're a little different to one I have in my stash. I've not tried this one but I might have to give it a go (nothing beats a little bit of chocolate). I love that feeling too! I spend half my time scrunching up my face at that point to make it crack and crumble hahaha! Major white chocolate lover here and I love these masks they're so quick and easy to just pop on. i bought this recently and i have yet to try! I love 7th heaven masks! They're so inexpensive and do wonders for a mini pamper on days where you need a little pick me up! I've not tried this one before but I definitely want to now! I missed your MJ mask reviews haha! <3 This one sounds great and something I think I need for my dull skin <3 thanks for sharing! I love making faces when the masks dry, I like looking at the wrinkles it creates on my face. (Is that weird?). 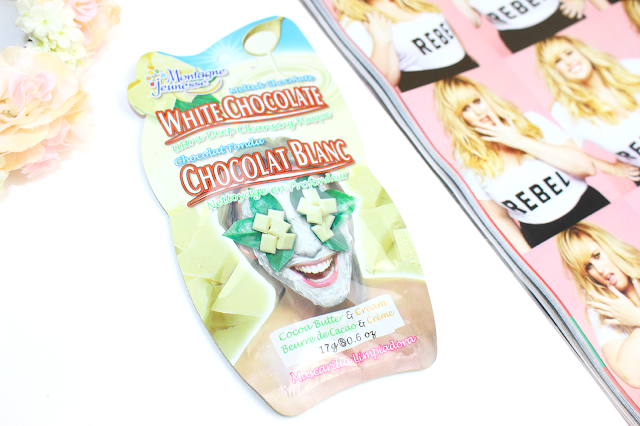 I've never heard of White Chocolate as a face mask, Totally going to have to look into this!